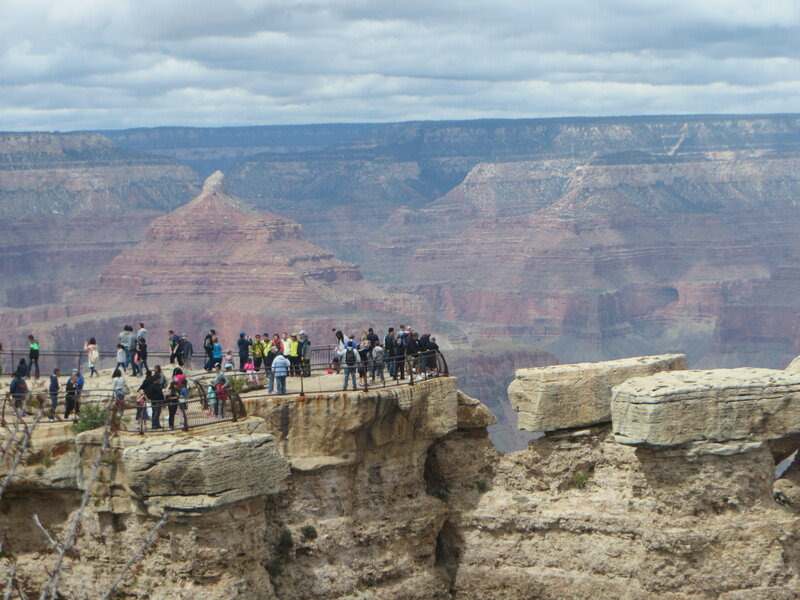 Most folks only see the Grand Canyon from overlooks at the rim. Some view it from down below aboard a raft, as they ply the waters of the mighty Colorado River. I have had the privilege of enjoying both these perspectives in the past, but now I was going to undertake what only one percent of visitors actually do: hike the entire way to the bottom of this behemoth. No mule riding for me! I wanted to make the journey on foot to get the full canyon experience and feel the ultimate sense of accomplishment in this feat. 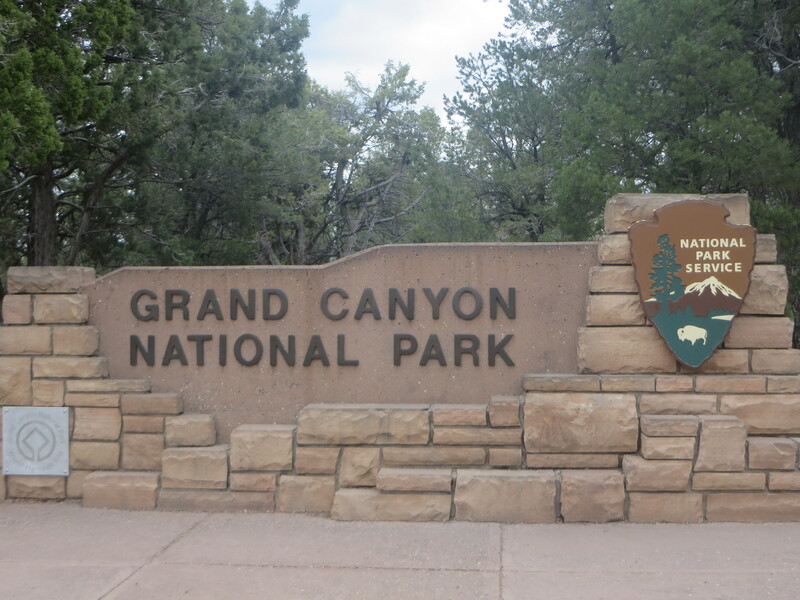 The Grand Canyon gained national park status in 1919, eleven years after being designated a national monument by President Theodore Roosevelt. Since then, millions of visitors have flocked to this awe-inspiring sight. Though it is not the deepest canyon, its overwhelming size and intricate and colorful landscape have contributed to its global fame and almost mythical status. Geologically, this landscape is significant because of the sequence of ancient rocks that are beautifully preserved and exposed within its walls. These rock layers provide a record of much of the early geological history of the North American continent. Additionally, it is one of the most spectacular examples of erosion in the world. 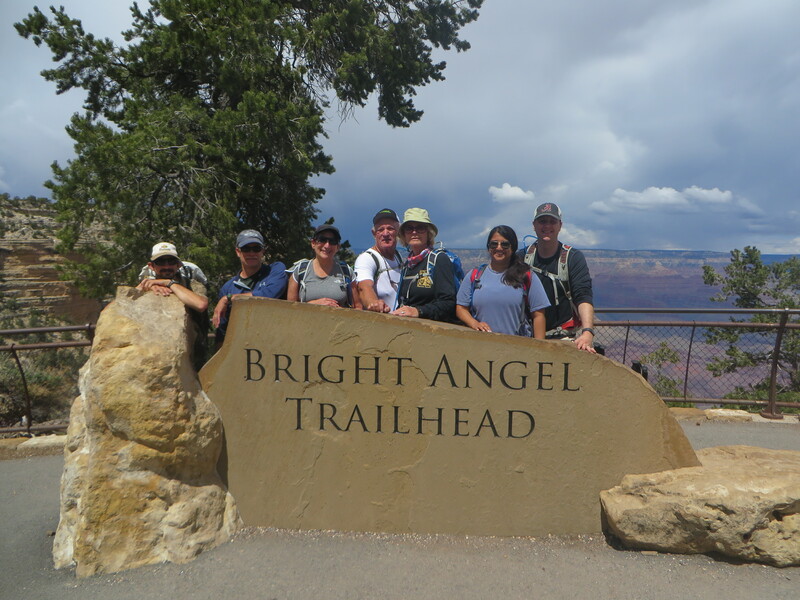 On Wildland Trekking’s 3-day Phantom Ranch Hiking Tour, your first day is spent on the descent into the canyon on the South Kaibab Trail, one of two “superhighways” in the Grand Canyon. 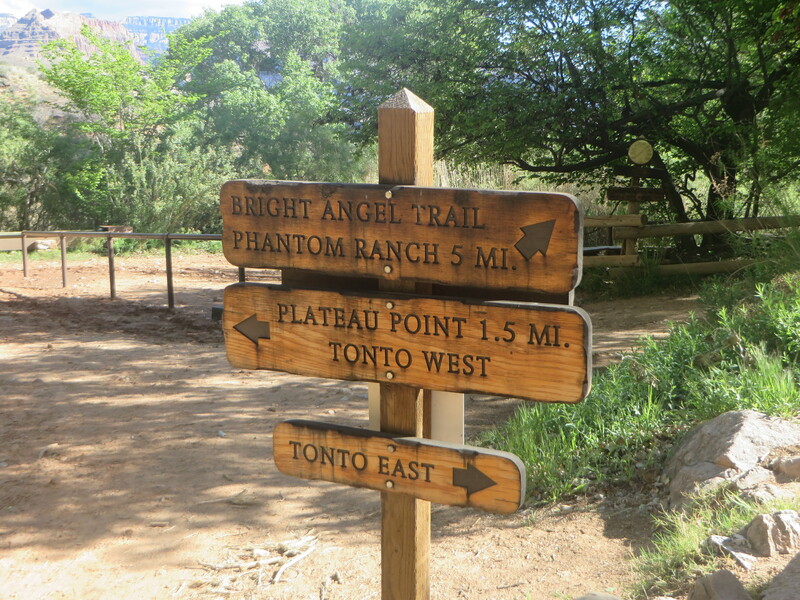 It’s about 7.5 miles from the trailhead near Yaki Point to Phantom Ranch, your home at the bottom of the canyon for the next two nights. 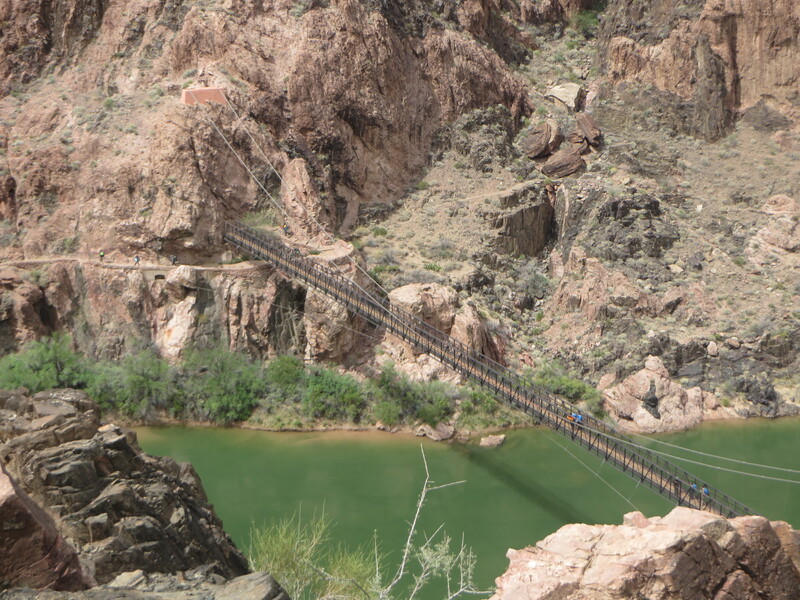 The South Kaibab was constructed in the 1920s in response to an uber-capitalist who insisted he owned the rights to the Bright Angel Trail, the one main route in existence at the time. 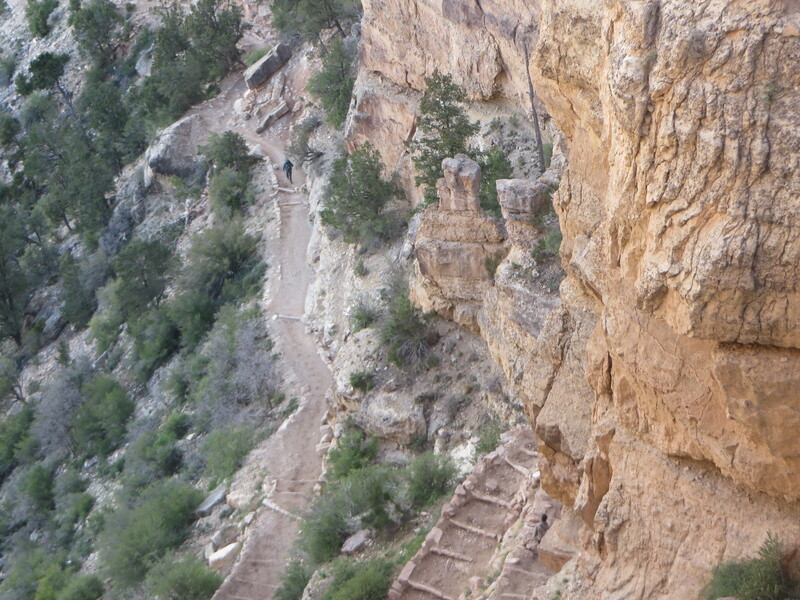 The National Park Service decided to construct a trail of its own, along a protruding ridge; the effect being that it is one of the most straightforward descents found in the Grand Canyon. It starts out steep and never lets up, but there are plenty of places to stop, to take in the spectacular views and rest your weary feet. At Oh-Ah Point, for example, you can look east towards Desert View Watchtower and see numerous side canyons that slash their way down to the Colorado River in deep, but regular intervals. Between each of these drainages, jagged rows of rock project up from the recess with their familiar lineup of weird looking, yet incredible buttes, spires, mesas, knobs, castles and temples with names like Vishnu, Brahma, Isis and Shiva. Other formations within the canyon honor explorers, scientists and heroes of different countries and cultures. There are even pirate- and Camelot-theme monikers or simply visually descriptive titles such as Cape Solitary, Kangaroo Headland, Point Retreat and the Alligator. As our group passed from one layer of rock to another, I noted the contrasts, particularly between the Coconino Sandstone, a pale almost white strip of rock, and the Hermit Shale, a bright red/brown layer beneath it. And then there are the purple quartzite boulders that stick up from out of the Redwall Limestone. The array of colors in the layers is sublime, due mainly to trace amounts of various minerals which impart the numerous hues to the canyon walls. What surprised me the most, however, was the number of trees in existence, as I never expected to see much green in the canyon. 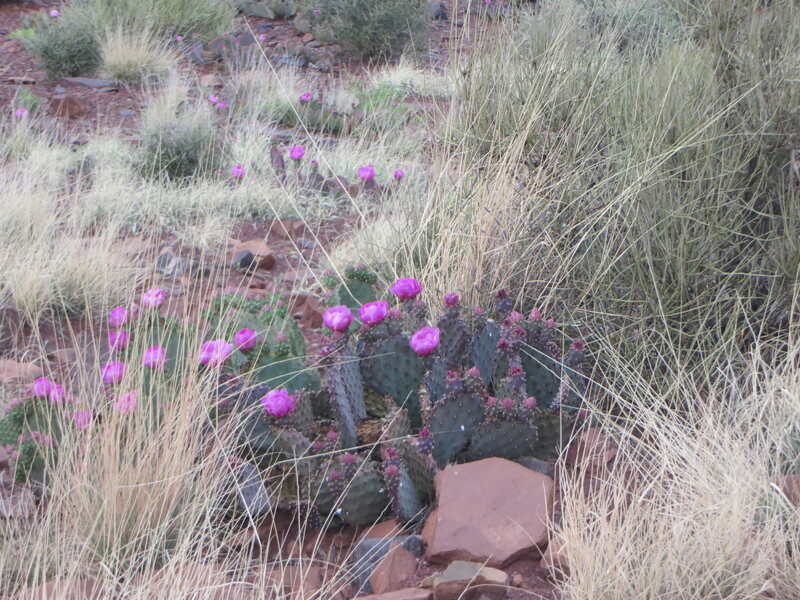 Further enhancing this palette were the wildflowers and cacti in spring bloom. 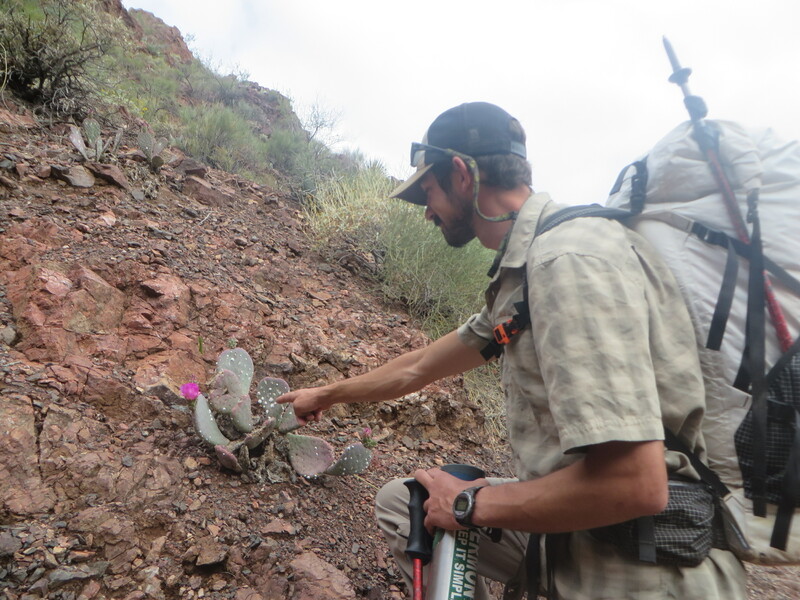 Dillon was the consummate guide, knowledgeable and attentive, with a passion for the Grand Canyon that was ever present. It was clear he loved his job for many reasons: the physical activity, meeting people from all around the world, sharing the beauty of this place with others and having an “office with incomparable views.” He regaled us with facts about all things Grand Canyon, including its history, geology, flora and fauna, pointing out the surprising diversity of plants and other living things that make their home in the canyon, as well as the different fossils embedded in the sandstone. 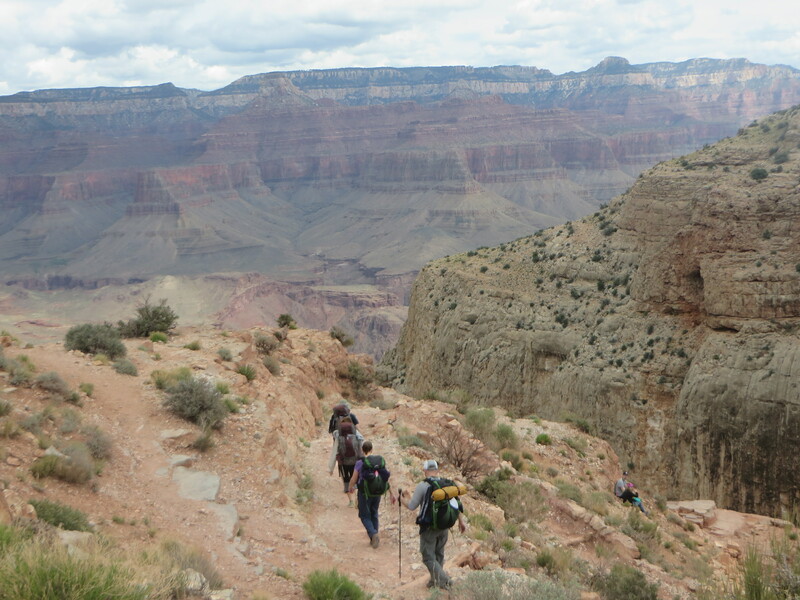 He reminded us that the canyon is the story of life enduring through desolation, drought and other harsh challenges. And he made us laugh with his delightful sense of humor, which served as a welcome distraction during times of fatigue. Most important, he was the bearer of our food, providing us with delicious picnic lunches and snacks galore to sustain us on our trek. He carried a forty-pound backpack, full of sustenance, first aid supplies, extra water, books and more, while nimbly navigating the trail. 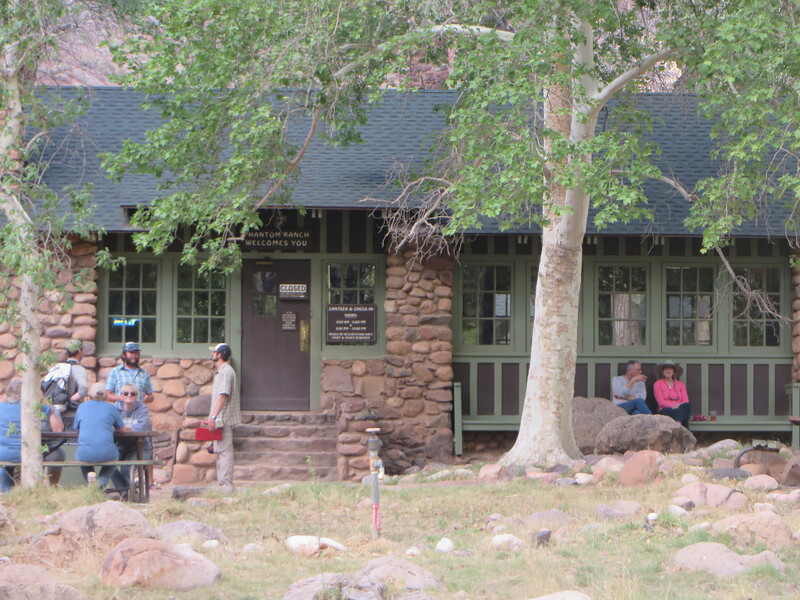 We merely toted our day-packs, as the mules had taken our overnight bags down to Phantom Ranch earlier in the day. At times, it was only our group on the trail and we felt like we were the only inhabitants in this magical world. Then, we would encounter others making their way up or down. The ones who were descending like us were talkative and friendly; whereas those ascending were intensely focused on the uphill challenge. 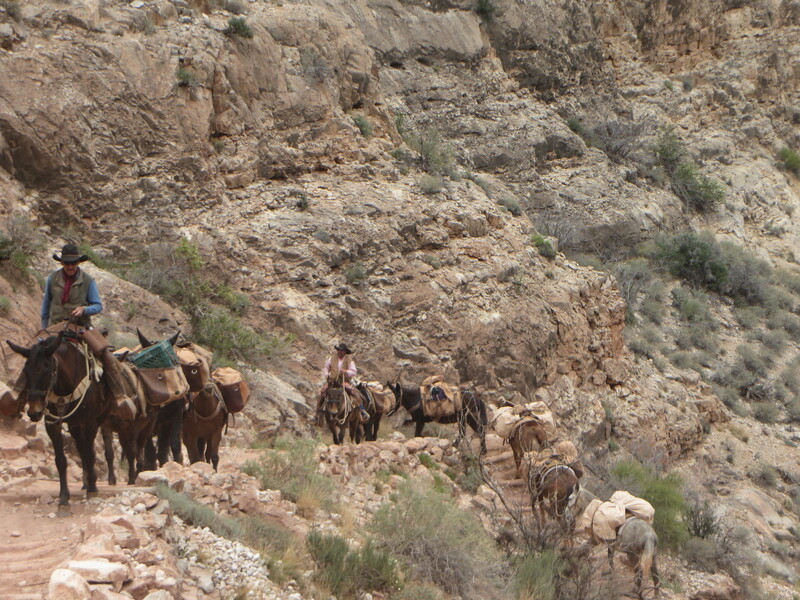 I knew I would be in their shoes soon enough, as I recalled the famous rule of the Grand Canyon: “Going down is optional; going up is not.” We also shared the trail with pack mules and mule riders, marveling at these creatures’ strength, stamina and ability to navigate steep switchbacks with agility. 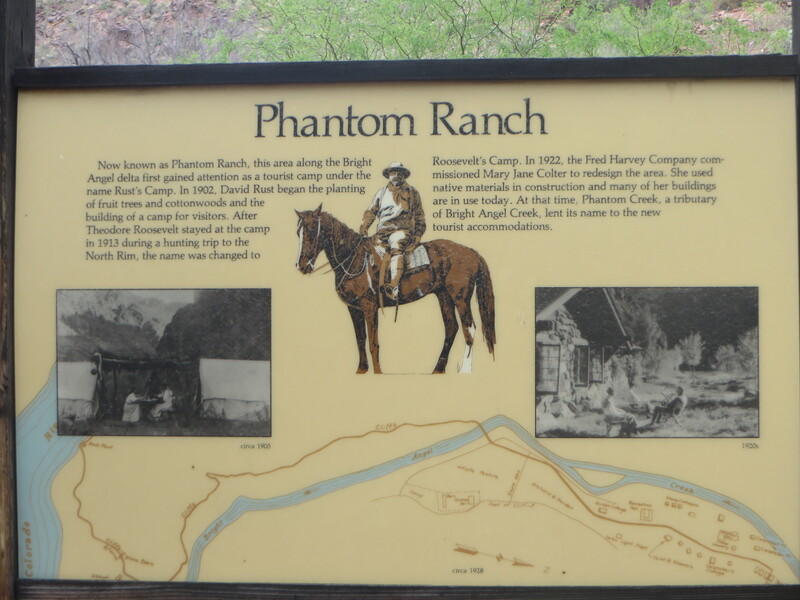 Phantom Ranch is the only outpost at the bottom of the canyon where you can spend the night, either at the campground nearby or at one of two types of accommodations: rustic cabins or dorms. Meals are reserved in advance and have set times at communal tables in the dining hall. Dinner is either hearty beef stew or steak with accompaniments. Vegetarian chili is available for non-meat eaters. A canteen is also on site with access to snacks, beverages, basic supplies, etc. It’s hard to believe that this piece of civilization exists in such a remote locale, but it’s certainly a welcome sight to tired hikers and backpackers and even the mule riders who arrive complaining about their sore derrieres. The ranch serves as a gathering spot, a crossroads of sorts, where people from all walks of life mingle and share their canyon experiences. All too soon the next day arrives and at the early hour of 5:30 a.m., we begin the trek to the top, this time using the Bright Angel Trail, the other main route through the Canyon. 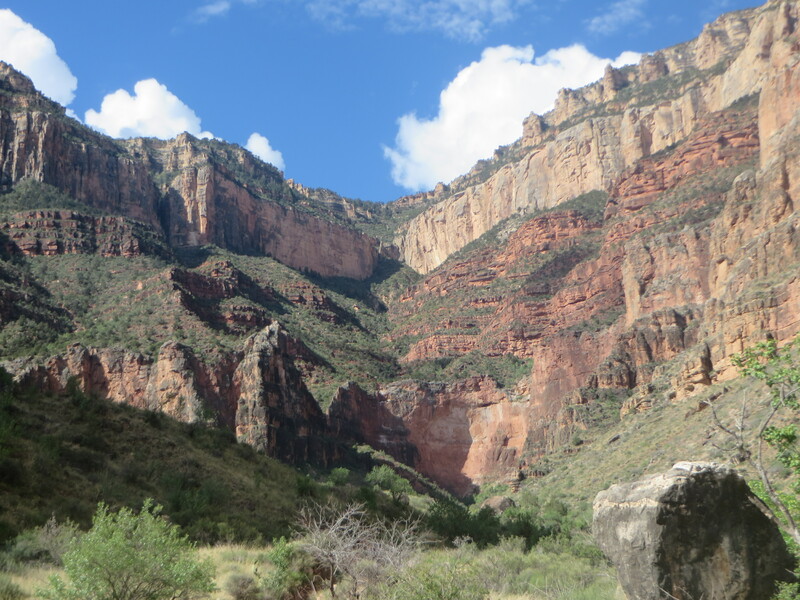 Though it’s longer (9.5 miles to the rim), this well-maintained trail has access to water in a few places, unlike the South Kaibab, where it’s essential to carry all your water with you for the entire hike. And there’s shade, glorious shade, in a number of spots, as well as several rest houses with toilets. 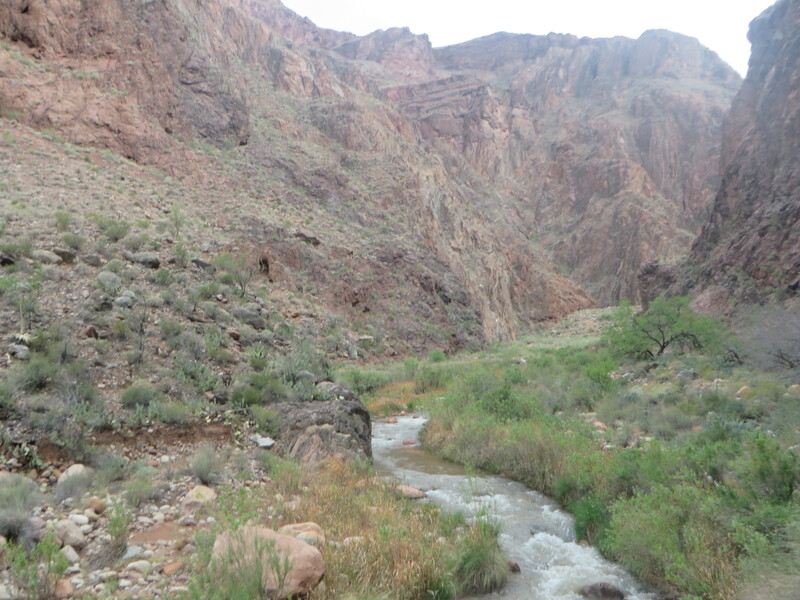 The first few miles of the route starts with an easy traverse along the Colorado River, followed by a beautiful hike up Pipe Creek Canyon. Seeing sunrise from this locale was an extraordinary experience. Though we soon lost sight of the river, the trail remained cool and green as it crossed over Garden Creek several times. Cottonwood trees provided ample shade, as the morning began to warm up. And mini-waterfalls added to the lovely charm of this fairytale-like scene.